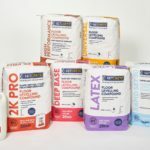 Manufacturer of high-performance floor preparation products, Setcrete, has redesigned the product packaging for its range of floor levelling compounds. The design of the product packaging has been refreshed with distinctive colour coding used to differentiate the products in the range. Highlighting the key benefits of each product, the new packaging has been designed to facilitate product selection.